Helen is an instrument scientist for the WOMBAT (high intensity powder diffraction) instrument at the Australian Centre for Neutron Scattering. She assists and collaborates with visiting scientists, works with the sample environment team in commissioning new equipment for WOMBAT and is co-responsible for improving and expanding the capabilities of the instrument. Her expertise is in the study of small molecules and ices under the conditions found in the outer solar system. Much of this work is motivated by the wish to understand the surface and interiors of planetary bodies. Prior to working at ACNS, Helen was based at the Powder Diffraction beamline at Australian Synchrotron where she developed her program of research on planetary ices. 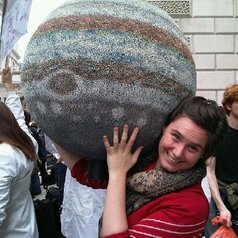 When not working on the instrument, Helen also works to promotes science to as wide an audience as possible, her skills in this area were honed whilst working as the Christmas Lecturer’s researcher for the Royal Institution of Great Britain.